Whatever you like best. Up until 1932, the IJsselmeer was an inland sea called the Zuiderzee. Since the Middle Ages, the area played a major role in the economic development of the Netherlands, but was also often severely flooded. A 32 kilometer long dike, finished in 1932, put an end to the flooding and turned the salty sea into a sweetwater lake. Along its banks many picturesque, historical harbour and trading towns, centuries-old polders (fields of reclaimed land below sea level) and beautiful inland villages are still witness to a rich seafaring past. Your week of sailing and cycling starts in Amsterdam. The crew welcomes you on board around 2 p.m until 6pm. Once all guests have checked in, the ship sails under motor to Monnickendam or Volendam. From the port of one of these former fishing villages, a short warm-up ride leads you through the rural nature reserve of Waterland with its many villages. A very Dutch start of the day: you cycle to a nearby, family-run cheese and clog shop for a short demonstration of cheese and clog making, and of course a cheese tasting. Continue pedaling along the dikes to Purmerend, in the heart of a polder named De Beemster, 11½ feet (3.5 meters) below sea level. It was created more than 400 years ago, when the Dutch transformed an inland lake into pasture land. Divided into a tight geometric pattern of squares and quadrants, it is recognized by UNESCO as a creative masterpiece. Your next destination is Edam, a lovely town whose lanes and canals deserve a stroll. Edam is known worldwide for its cheese covered in red or yellow wax. This practical solution keeps the cheese fresh for a long time, so 17th century sailors could take it on their voyages or trade it for spices and other riches of the East. Via the main dike of the IJsselmeer you arrive at the promenade of Volendam, where the ship is docked. Later in the afternoon, the ship sails to Hoorn. Through small rural hamlets and villages, today’s ride brings you to Enkhuizen. Pass by windmill De Krijgsman (The Warrior), the highest windmill in the province of North-Holland and one of a handful of old Dutch windmills still in use to produce flour commercially. The area is also known for its many greenhouses, where vegetables are grown. In the 17th century, Enkhuizen was one of the wealthiest cities in Holland, thanks to its harbour that shipped then-costly spices from Asia. Be astonished by the stately mansions, canals, churches and city walls that to this day reflect the city’s rich history and wealth. In the afternoon, weather permitting, we sail across the IJsselmeer to the port of Urk. On board, you can help the captain sail the ship if you wish. Or you can simply sit back on deck and enjoy the invigorating journey, while keeping watch for marine bird life. In the evening you may stroll through the narrow streets and alleys of Urk. The houses in this picturesque fishing village were built close to one another on elevated grounds to protect them against the water, and that is still visible today. After breakfast, cycle along the lake on a tarmacked cycle path to the former island of Schokland. 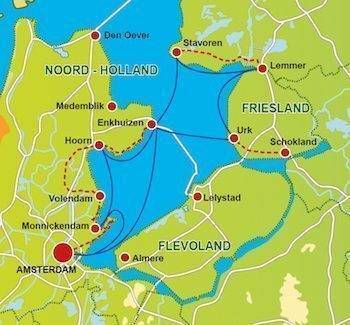 Since the reclamation of the Northeast polder (Noordoostpolder) in 1942, Schokland – just as Urk – is no longer an island. Since 1995, it belongs to the cultural heritage of UNESCO. Continue your bike ride through the polder to Vollenhove, another charming, former fishing village. From Vollenhove, cycle paths through open countryside lead you to the small town of Blokzijl. This is where you enter the Weerribben-Wieden National Park, the largest freshwater wetland in northwestern Europe and a peaceful oasis for plants, animals and humans. A bicycle path through the center of the park takes you far away from roads, immersing you in the tranquility of this region. Keep your eyes peeled for a fleeting kingfisher or—if you’re really lucky—an otter, the symbol of the park. You pass through Kalenberg, a village that till the fifties of the last century could be reached by boat only. A twisting route through an agricultural landscape of narrow strip fields surrounded by dikes takes you to the town of Sint-Jansklooster and subsequently to the small city of Zwartsluis. Here you’ll get back on the ship. Today you can enjoy a full day of sailing and relaxing on board. Again, you can help the captain sail the ship if you wish. Or you can simply sit back on deck and relax. Early afternoon the Elizabeth will arrive in Lelystad, capital of the province of Flevoland that was entirely reclaimed from the sea. Here you can stretch your legs and visit the Batavia Werf, an extraordinary shipyard, where ships with an important maritime history are taken from oblivion and returned to their former glory. Or go shopping at Batavia Stad, an outlet center with all the famous brands. In the morning you’ll disembark for your last half day of cycling. You’ll ride through the Oostvaardersplassen—a nature reserve on new land, left to find its own balance like nature did in old times on old land. Sections of the ride wind through forested areas, while others give you panoramic views of expansive reed beds and marshes. This is a birdwatchers’ paradise. The ship picks you up in the small harbor of Oostvaardersdiep for the return voyage to Amsterdam. Celebrate this marvelous week around the IJsselmeer while having a farewell dinner aboard the ship. The Lake Ijsselmeer Boat & Bike cycling holiday includes the daily transfer of luggage to the next hotel and local support if required. Daily complimentary coffee and tea on board until 4 PM.